This Oct. 31, 2017 satellite image shows China's installations on Mischief Reef in the South China Sea. 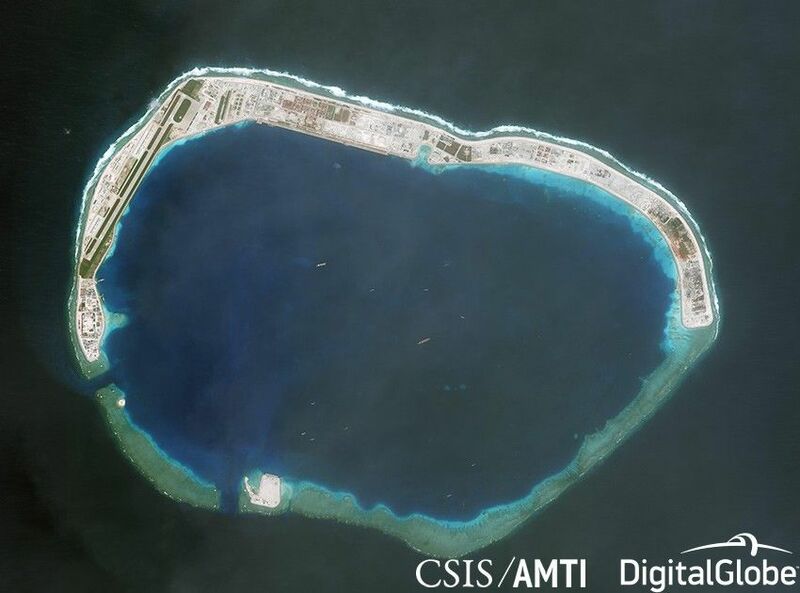 MANILA, Philippines — China has been quietly testing its electronic warfare capabilities on its bases in the South China Sea, according to reports. American television network CNBC reported that this is the first known use of such equipment since Beijing deployed electronic jamming equipment in the Spratly Islands. The CNBC report was based on sources who have seen US intelligence reports. Beijing's electronic warfare assets in the Spratly Islands have the capability to confuse or disable communications and radar systems. This move comes amid China's installation of anti-ship cruise missiles and surface-to-air missile systems on Fiery Cross, Mischief and Subi Reefs. China's coastal defense systems and electronic warfare equipment in the South China Sea further strengthen the country's military portfolio in the region, the report said. Beijing, on the other hand, have been insisting that it is not militarizing the disputed South China Sea. "China is only building civilian and some necessary defense facilities on our own islands. That is the right to self-defense and preservation of every sovereign state,” Chinese Foreign Minister Wang Yi earlier said. Aside from the Spratly Islands, China also has 20 outposts in the Paracel Islands, including Woody Island, its largest military headquarters in the area. Beijing has built an airstrip, helipads and 20 hangars that can accommodate combat aircraft, J-10 and J-11 fighter jets, HQ-9 surface-to-air missiles and anti-ship cruise missiles on Woody Island. The Chinese Air Force's deployment of a nuclear-enabled bomber on Woody Island raised alarms as the bombers could reach almost the entire South China Sea. The US Department of State withdrew its invitation to China in the biannual Rim of the Pacific Exercise, the world's largest multinational naval drills. China, meanwhile, accused the US of "hyping" the South China Sea issue and pointed out that US military presence in the region exceeds the total military strength of Beijing.